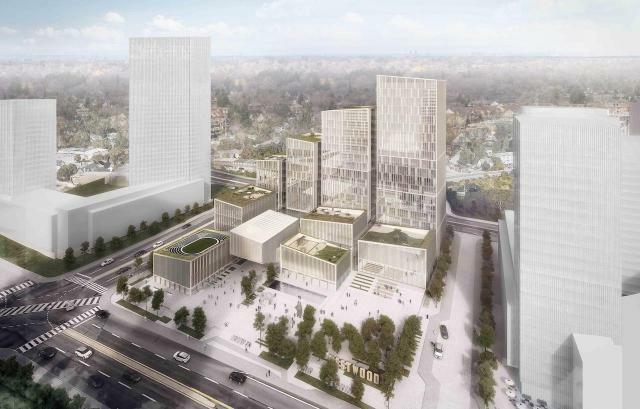 Four teams submitted competition entries for a new Civic Centre for Etobicoke to be built on the east side of Kipling Avenue between Bloor and Dundas Streets. The first group of 12 images in this file are from the winning team of Henning Larsen, Adamson Associates, and PMA. The next group of 22 images in this file are from the team of KPMB Architects and West 8. The second last 10 images in this file are from the team of Diamond Schmitt, Michael Van Valkenberg Associates. The last 12 images in this file are from the team of Moriyama & Teshima, MJMA Architects, and Forrec.